What is it about the Atari 2600? It was the summer of 1983 at Jeff Mccall’s slumber party when I saw my first game console. Crowded around the small TV we gawked at the thing – an Atari VCS. The seven of us took turnst. Passing the joystick around like a sacred relic we navigated Pitfall Harry over hazardous lakes, crocodiles and scorpions. One by one the other kids fell asleep. Having no need of such mortal frivolity, I played Pitfall all night! I fainted in the street the next day due to sleep deprivation. Worth it. It’s kind of mind-blowing that games that originally sold for over $30 ($70+ in 2018 money) can now be completely stored in a QR code on a small piece of paper. As a poignant visual metaphor for showing my kids how much technology has changed, I decided to create a Raspberry Pi based Atari that accepts “paper carts” of actual Atari 2600 games. The QR in QR Code stands for Quick Response. It’s a kind of 2d barcode that was invented by a Japanese company named Denso Wave in 1994. They put it into the public domain right from the get go, so it’s used a lot of places in a lot of ways. QR codes have a secret power – they use something called Reed-Solomon error correction. It has the amazing ability to fill in missing parts using extra parity data. More parity data, more missing data can be reconstructed. Not certain parts, ANY OF THE PARTS. I know, right? Reed-Solomon is also used in CDs, DVDS and Blu-ray, that’s why a scratched disc can still work. Remember those .par files on Usenet you’d use when you were downloading a bunch of stuff in chunks? Yep, parchives were based on Reed Solomon. I hid a fun Atari fact in this code. I’ve encoded some text in the above QR code with error correction set to Level H (High), which means up to 30% can be missing and you can STILL read it! 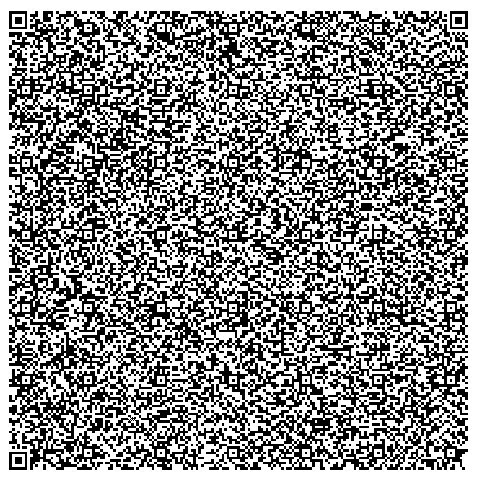 Go ahead, block some of it with your fingers, put your phone in camera mode and point it at the QR code above. Does it work? That’s the Reed-Solomon stuff kicking in. QR codes automatically jump to larger sizes to encode more data – from version 1 to version 40. Can you find your way out of this maze? Does your brain hurt yet? Hope no one took that seriously and actually tried. Above is a version 40, the most dense version. My iPhone is able to read this one right off the screen too. If you have problems, you can try zooming into the page a bit maybe. This is the first 2900 characters of Alice In Wonderland. We can store a max of 2,953 full bytes. A byte is 8 “yes or no” bits. With that, you can store a number between 0 and 255. Because text doesn’t need a whole byte, there are smarter ways to store it which would allow us to pack in much more than we did here – but let’s ignore that as we’re only interested in binary data. If I show the QR code too clearly, I might be enabling rom piracy and get in trouble. Weird, right? This game (Stampede) has 2,048 bytes (2K) of rom data so it easily fits inside a single QR code. Other Activision classics like Fishing Derby and Freeway are also 2K games but Pitfall! is 4K game. Using gzip compression saves us nearly 20% but it’s still a bit too big to fit in a single QR code. To work around this I’ve added a “Side B” to the other side of the Pitfall! card. Cart. Whatever it is. My paper cart format stores some metadata so the reader can know how many QR codes are needed for the complete game, as well as if the data is for the same game or not by storing a rom hash in each piece. So now I just needed to write some software that will monitor what the Pi camera sees, read QR codes, notice when no QR code is present or it has changed and start/stop the emulator as appropriate. Naturally I chose Proton SDK as the base as it handles most of what I need already. For the QR reading, I use zbar, and for the webcam reading I use OpenCV and optionally raspicam instead. (no need for OpenCV on the Raspberry Pi linux build) I put it on github here. 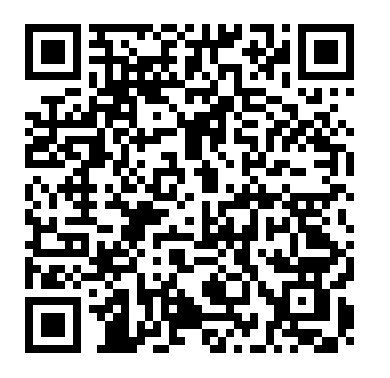 It will generate myrom_1_of_1.html or if multiple QR codes are needed, a myrom_1_of_2.html and myrom_2_of_2.html and so on. I opened in the web browser, cut and pasted them into photoshop, scaled them down (disable antialiasing!) to the correct size and printed them. It’s pretty straight forward if you’re comfortable with linux and Raspberry Pi stuff. Here are instructions to set it up and download/compile the necessary software. Now we’ll install and compile raspicam, a lib to control the camera with. Note: It acts a little weird, possibly because it’s using outdated MMAL stuff? In any case, it works “enough” but some fancier modes like binning didn’t seem to do anything. Build the media for it. It converts the images to .rttex format. .rttex is a Proton wrapper for many kinds of images. 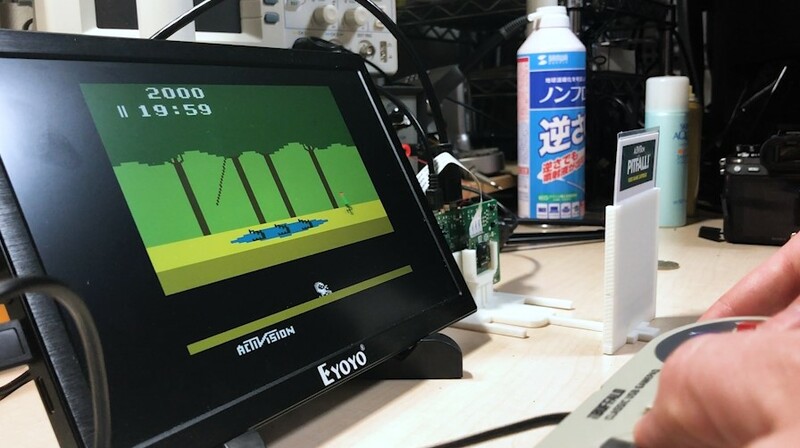 If things work, you’ll see what your camera is seeing on your screen and if a QR code is read, the screen should go blank as it shells to run the atari emulator. You can point your camera at a QR code on the screen and it will probably work, or go the extra mile and print paper versions because they are fun. You don’t have to laminate them like I did, but that does help them feel more sturdy. You might need to twist your camera lens to adjust the focus. I setup mine to automatically run when the Pi boots (and not Emulation Station) so it works very much like a console. I sort of imagined designing a stylish 2600 themed case with a slot for the paper cart and fully enclosing the Pi, but that would take skill and also require some kind of light inside so the QR could be read. So instead I did the minimum – a thing to hold the PI, camera, and easel where you insert the QR code paper. I used Fusion 360 and designed the stand parametrically so you can fiddle with values to change sizes pretty easily. The modules are designed to snap together, no screws needed. You can download the Fusion 360 project here, the download button allows you to choose additional formats too. You need to kind of use common sense and print with supports where it looks like you need them. So that’s great, but you’d like to store Grand Theft Auto 5 as QR codes because they are so convenient? Let’s see, 70 gigabytes. No problem. To convert that you’ll just need about 25 million QR codes. You might want to order some extra ink now. At one code per paper, the stack would reach a mile and a half into the sky. This entry was posted in Development/RTsoft, Tech Tips and tagged Atari, raspberry, Retro on August 16, 2018 by Seth. However I still get many errors and compile failure. By chance is there step by step instructions for compileing the windows Exe or else a copy of RTPaperCart.exe for download?… I really love this project and would like to mess around with it. Hey Jeff, happy to help if I can. Were you able to compile Proton examples like RTBareBones? The PaperCart project needs to be in a subdir of the main Proton SDK dir, similar to how its examples (RTBareBones and RTSimpleApp) work. Feel free to post some errors either here or the Proton forums and maybe I’ll notice what’s wrong.